We're registered as a not for profit organisation, everything we do is with the aim of science communication around biodiversity, evolution and conservation. We offer a partnership scheme with the aim of sharing what we've created for free. 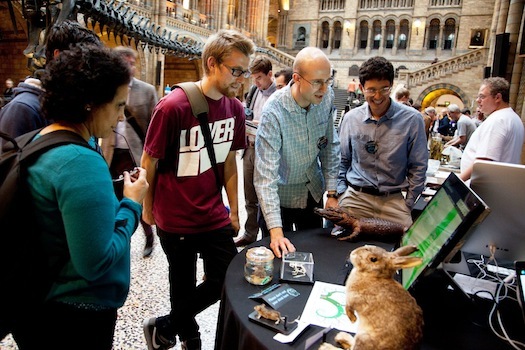 Our team includes a range of experts in biology, computing and science communication. Any not-for-profit venues choosing the option of including leaf sponsorship in their displays can benefit through sharing of donations made through their display. We foster close mutual relationships with data providers including Encyclopedia of Life and Open Tree of Life. The OneZoom software has been a recognised leader in this field for over five years. We've built the whole visualisation codebase from the ground up with tree of life visualisation in mind, so everything is optimised for this use case and easily adapted. 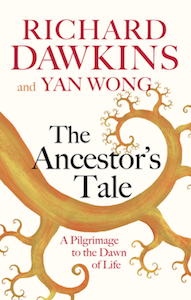 Our reach stretches beyond museum installations and includes a significant online presence as well as uptake with other media types including books such as the Ancestor's Tale by Richard Dawkins and Yan Wong. These multiple angles feed into each other synergistically. 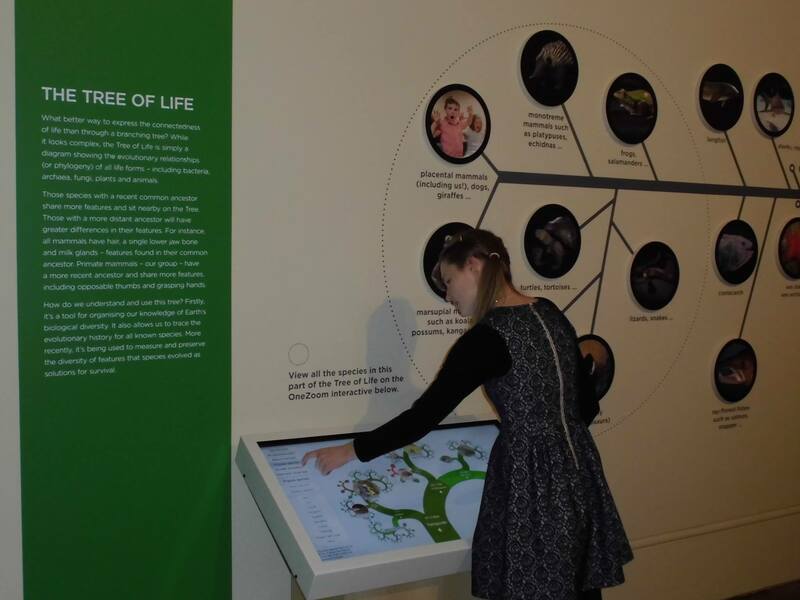 The tree of life used in our displays includes over 2 million species covering all known life on earth, except some bacteria and extinct species. 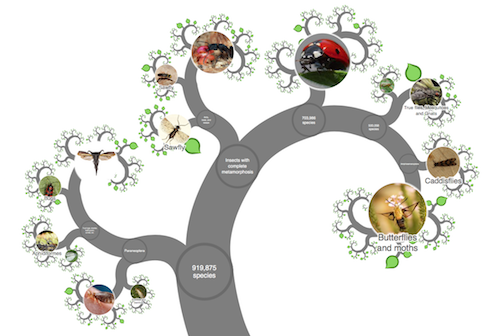 More than 130,000 different images of species are integrated into the tree. Dates of common ancestry are included in many popular areas of the tree. Rich metadata are mapped onto our tree including extinction risk (from IUCN), species popularity for every species (our own metric) and common names in 160 different languages. Our data are updated automatically and regularly curated by biologists using reliable sources. Displays can be customised to fit with the theme and learning aims of an exhibit. A choice between several visually beautiful and distinctive tree designs with the option to work with us to create a new one using the OneZoom framework. Easy to use navigation, like a map with zooming and panning by full multi-touch, or by tapping on simple signposts. Integrated search feature, including common ancestor search. Location feature shows where you are in the deeply hierarchical tree strucuture. Lots more is planned and we'll prioritise development of the most wanted features. * indicates features currently only available in our older sofware which is open source. We are working towards incorporating those features and many news ones into the latest version of OneZoom for use in public display installations. 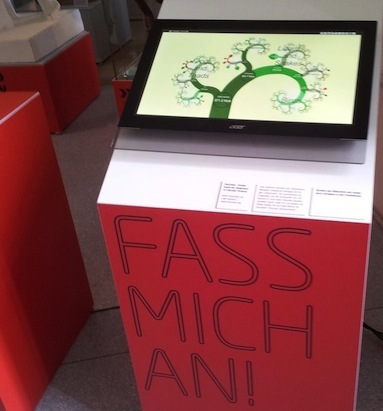 Our software for interactive displays is focused on the tree of life and has appeared in various forms at eight venues in five different countries to date. Beautiful Science at The British Library 20th February 2014 - 26th May 2014.